"We routinely monitor foreign defense activities and we are aware of this test," Marine Corps Lt. Col. Jeffrey Pool, the spokesman, told the Washington Free Beacon. "However, we don't comment on our intelligence or assessments of foreign weapon systems," Pool said in a statement. "We encourage greater transparency [by the People’s Republic of China] regarding their defense investments and objectives to avoid miscalculation," he added. China military affairs specialists said the hypersonic vehicle test is a significant milestone and appears to be part of China’s development of asymmetric warfare weaponry that Beijing calls "assassin’s mace" weapons—high-technology arms that would assist China’s overall weaker military forces to defeat the more technologically advanced U.S. military. "A boost glide missile theoretically would be intended to counter existing mid-course missile defenses," he said, noting that Chinese technical studies have shown the vehicle would use penetrating radar for its high-altitude targeting. "Hypersonic aerospace flight vehicles exemplify the merging of the air and space domains from both operational and industrial perspectives," Stokes said. "With the integration of strategic analysis and planning into technical research, China’s pursuit of hypersonic and high-precision weaponry promises to be faster and more focused than that associated with its previous [anti-satellite] and [ballistic missile defense] related research and programs," Saalman said in an email. "This recent test is a manifestation of this trend." Hypersonics and precision guidance "are growth areas within China in terms of what they are intending to do with their military," she said in a recent speech. "The beauty of the HGV is that it can perform hypersonic precision strikes while maintaining a relatively low altitude and flat trajectory, making it far less vulnerable to missile defenses," said Fisher, an analyst at the International Assessment and Strategy Center. "I'm not against that, but the lessons of recent history are pretty stark: a paranoid Communist dictatorship is going to seek maximum power to sustain its position no matter how friendly you try to treat it," Fisher said. The Chinese are "actively seeking global military power to challenge the United States, and it is not yet in any mood to talk, or engage in arms control, about it," he said. Instead of seeking military and other hot line communications, the U.S. government should build on select military superiorities in order to deter China into the 2020s and beyond, Fisher said. "I don't see this administration being seized with this real challenge," he added. 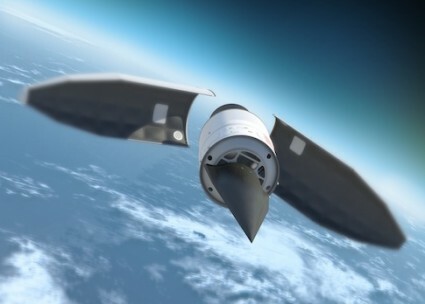 A second paper from April concluded that hypersonic weapons pose "a new aerospace threat." It reveals that China has studied the U.S. Air Force’s experimental X-37B Space Plane in order to "effectively track and intercept" hypersonic vehicles. "Hypersonic aircraft in aerospace usually have the following unique characteristics: high, fast, and small," the paper states. "Their motion is highly variable. As a result, this type of target is very difficult to track." The Air Force National Air and Space Intelligence Center said in its annual report on missiles last year that Russia is building "a new class of hypersonic vehicle" that would "allow Russian strategic missiles to penetrate missile defense systems." "Today, we are experiencing a revolution in military science," Rogozin told Russian television June 23. "This revolution is connected with the rapid development of highly accurate means of destruction. These are cruise missiles and high-speed rocket weapons. In the future, there will be hypersonic weapons." Rogozin described Moscow’s test of an advanced road-mobile ICBM, called the RS-26, as a "missile defense killer." Russian news reports said the missile flight test involved three dummy warheads that are hypersonic arms designed to defeat missile defenses. Ian Easton, in a report published by the Project 2049 Institute, said China’s hypersonic weapons are part of what he called "the Great Game in space." "If there is a great power war in this century, it will not begin with the sound of explosions on the ground and in the sky, but rather with the bursting of kinetic energy and the flashing of laser light in the silence of outer space," Easton said.